Aid agencies say Israel’s continuing assault threatens to bring humanitarian catastrophe to Gaza [Reuters]. Israeli fighter jets have continued to bombard the Gaza Strip for a sixth day, as the United Nations fails to agree on the wording of a draft resolution. 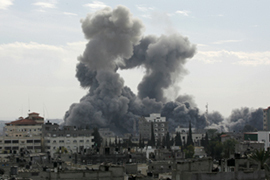 Early on Thursday morning, Israeli air strikes hit government offices – including the parliament building itself and the justice ministry. 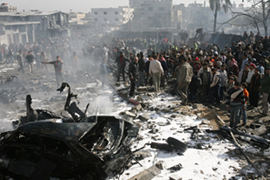 Palestinian officials said the attacks left four people dead and at least 25 people injured. Meanwhile, Hamas rockets were again fired at the southern Israeli town of Beer-sheva, which lies around 40 km from the border. Ayman Mohyeldin, Al Jazeera’s correspondent in Gaza, said Israeli fighers had hit the Palestinian Legislative Council – the parliament building and both the education and justice ministries. He said the overnight strikes brought the total Palestinian death toll to around 400 – including many civilians. Mohyeldin said the parliament building held special significance for Hamas – who overwhelming won parliamentary elections held in 2006 in both the Strip and the West Bank. With international pressure mounting on both sides to agree a ceasefire, the UN security council failed to agree on the wording of a draft resolution to end the violence at an emergency meeting held late on Wednesday in New York. The special session of the security council followed calls from Arab countries for an urgent resolution demanding an immediate ceasefire, and warnings from aid agencies that the people of Gaza are facing a humanitarian catastrophe. The attempt to draft a resolution failed after the US and the UK requested that the document should be amended to mention Hamas rocket attacks against Israel. The US has said any lasting ceasefire is dependent on concrete assurances from Hamas – in terms that are acceptable to Israel – that the rocket attacks will stop. Israel has so far rejected calls for a ceasefire and has continued to build up its forces along the border in preparation for a possible ground invasion. It says the assault is aimed at the Hamas leadership in Gaza and intended to destroy the ability of its fighters to launch rocket attacks on Israeli towns and cities. Our correspondent in Gaza said the UN’s failure to reach an agreement over Gaza “doesn’t come as a surprise to Palestinian people” who have “little faith when it comes to any kind of UN resolution that will really make any impact on the ground”. In the latest diplomatic push to end the violence, Tzipi Livni, the Israeli foreign minister, and Nicholas Sarkozy, the French president, are expected to hold talks in Paris later on Thursday. Despite the fact Sarkozy ceased to hold the rotating presidency of the European Union as of midnight on Wednesday, he will host the meeting aimed at brokering some form of ceasefire. Earlier on Wednesday, the Israeli cabinet rejected a French proposal to agree a 48-hour ceasefire on the grounds it was seeking a “durable solution” and that a temporary truce would simply allow Hamas fighters to regroup and re-arm. Al Jazeera’s Alan Fisher said Sarkozy’s diplomatic efforts at the time of last year’s war between Russia and Georgia had been widely praised. Other diplomatic efforts are under way in the region, with Recep Tayyip Erdogan, the Turkish prime minister, on a tour of the Middle East in a bid to broker a peace deal that would have the backing of key Arab states. At least 1,600 Palestinians have been injured as Israeli warplanes and helicopter gunships have dropped hundreds of bombs and missiles on the densely-populated strip. Israel has described itself as in an “all-out war” with Hamas – the Palestinian faction that has controls the Gaza Strip – since a fragile six-month ceasefire between the two sides came to an end on December 19. Special Note: There will be a demonstration in front of the Israeli embassy ini High Kessington Street, London this Saturday, 3rd January 2009. At the same time the Durham County Palestine Solidarity Campaign will also organise a demonstration in Durham. Please join this demonstration and bring your friends as many as you can to express outrage at the Israeli attacks and support for the Palestinians, and to urge international leaders to act now to restrain Israeli aggression and violence.